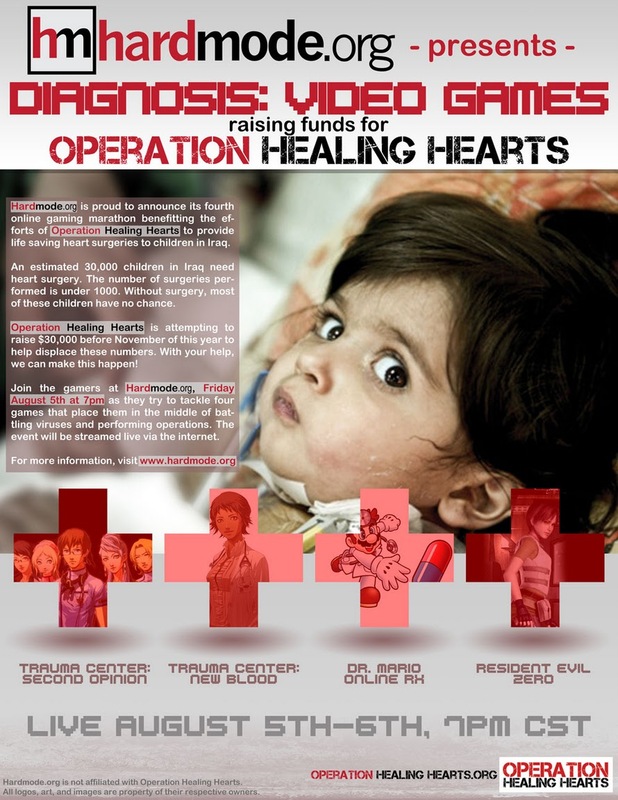 We at Hardmode.org are very pleased to announce our fourth event: Diagnosis: Video Games! Working with Operation Healing Hearts to raise funds for the Preemptive Love Coalition to aid children in Iraq with congenital heart disease, we hope to help OHH knock out their $30,000 fundraising goal, and with your help we can do just that! Awareness for congenital heart defects isn’t equal to the scope of the problem. Many people have never heard of CHD unless directly affected. CHD isn’t rare. It’s sadly all too common all over the world, including the United States. But, in Iraq, babies are born with broken hearts at an alarming rate. Congenital heart defects, also congenital heart disease, means that a person is born with a heart problem. The heart defect develops within the first weeks of life, often before a mother even knows she’s pregnant. The seriousness of the defect varies widely, many people have little to no physical side effects. Other babies need surgery within a first few days after life to survive. Sometimes, a child can live several years before needing a surgery. Often, multiple surgeries are required. An estimated 30,000 children in Iraq need heart surgery. The number of surgeries performed is under 1000. Without surgery, most of these children have no chance. REMEDY MISSIONS are international pediatric heart surgery teams we bring to Iraq to perform surgeries on children and train doctors and nurses. Remedy Missions drastically reduce the cost of saving a life per child and reduce per hour training costs for Iraqis. Operation Healing Hearts is hoping to raise this amount by November of 2011, and Hardmode.org is glad to help in these efforts! Diagnosis: Video Games is set to start on Friday, August 5th at 7pm CST and should run all through Saturday. Join us for a great time, prizes, and the chance to help out a great cause! Hardmode.org is not affiliated with Operation Healing Hearts or Preemptive Love Coalition. 100% of donations go to Operation Healing Hearts for their goal of raising $30,000 for the Preemptive Love Coalition. By reading through this you have acknowledged that you are super cool and want to help people. You should probably treat yourself to something nice. We look forward to seeing you in August!